This Low-Carb Vegetarian Chili Rellenos Bake is a healthier and easier-to-make version of Chile Rellenos. This is just as delicious as the chile rellenos you get in a restaurant and this easy version is also Keto, low-glycemic, meatless, gluten-free, and South Beach Diet friendly. Use the Diet-Type Index to find more recipes like this one. Click here to PIN Low-Carb Vegetarian Chile Rellenos Bake! This recipe for Low-Carb Vegetarian Chile Rellenos Bake is a healthier and easier-to-make version of Chile Rellenos, a well-known Mexican dish of stuffed, battered and deep-fried green chiles filled with cheese. The recipe came from my former neighbor Brooke, who shared it with me after I tasted her version at a neighborhood block party. 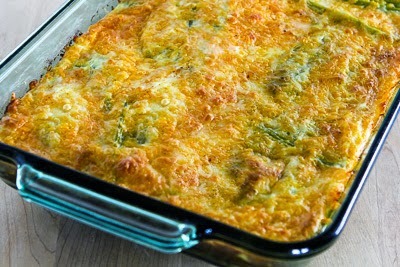 I changed the recipe slightly to make it a bit more carb-conscious and South Beach Diet friendly, but essentially this idea of layered green chiles and cheese held together with a little egg came from Brooke’s recipe, so thanks Brooke! I’ve enjoyed this Low-Carb Chile Rellenos Bake many times for a breakfast dish, but you can also cut it into small squares and serve with toothpicks for a holiday appetizer. And this is so perfect to make on the weekend and eat for breakfast for a few days during the week; enjoy! You can find lots more meatless recipe ideas in the Recipes-by-Photo Index for Meatless Monday, or find them by checking Vegetarian Recipes in the recipe index. I also have a very active Meatless Monday Pinterest board with ideas from blogging friends. You’ll need a big can of whole green Anaheim chiles like this one to make this recipe, and I’m sorry if this ingredient is hard to find in some places. In Utah I can find them at most every grocery store, and also in Mexican markets. You can buy whole green chiles at Amazon.com, although I’m sure they’re more expensive that way. Of course you can roast your own green chiles for the dish as well, and you could probably make a slightly different version of this using other types of roasted peppers. Drain the chiles well then split them open and remove any seeds. Lay chiles on paper towels and blot dry. I like to stack them up in two piles so I can make the layers even. Make half of the chiles into a layer in a casserole dish that’s about 9″x13″ or close to that size. Top the green chiles with a generous amount of cheese and sprinkle on green onions if you’re using them, then make a second layer of chiles and cheese. Then beat eggs, mix in the milk and spices, whisk together, and pour the egg mixture over the top. Bake about 40 minutes (covered with foil for the first 15 minutes), or until the mixture is set and the top is lightly browned. This easy version of Chile Rellenos is just as delicious as the chile rellenos you get in a restaurant. Put green chiles in a colander placed in the sink and let drain for about 15 minutes. While chiles drain, preheat oven to 375F/190C. Top the layer of chiles with half the grated cheese, then sprinkle on green onions (if using). Make another layer of flattened chiles, followed by the rest of the cheese. Put eggs into a bowl and beat well, then add milk, ground cumin, and chile powder, and stir until well combined. Cover dish with foil for the first 15 minutes of baking time, then remove foil and bake until mixture is bubbling and cheese on top is lightly browned, about 40 minutes total baking time. You can cook it without the foil, but watch it carefully or the top will get too brown. Cooking time without foil will be slightly less. Serve hot, with sour cream and salsa if desired. This will keep in the fridge for a few days, but you probably won’t have any leftovers. This recipe from Brooke with slight adaptations by Kalyn. This Low-Carb Vegetarian Chile Rellenos Bake is good for any phase of the South Beach Diet or any type of low-carb eating plan. South Beach would recommend low-fat dairy products while other low-carb eating plans would use full-fat dairy. My husband loves this dish, and we like to add Tabasco chipotle on top, it is amazing. Asked my husband what he wanted on the menu this week and he wants this again, about the 5th time I’ll have made it! Thank for this delicious recipe that keeps us on our keto diet. Can I add sausage to this recipe? If so how would I go about it. I think sausage would be delicious, in fact I think I will try that myself. I’d brown the sausage in a frying pan, then add the cooked sausage over the green chiles, before you put the cheese on! Love to hear how it works! Made this last night. What a winner. Will be making again for sure. And you are right… No leftovers. Everyone who was here asked for the recipe. Hi , I am planning to make this for a party and one of the guests have egg allergy. So I was wondering ,is it okay to leave the eggs out of the recipe ? I don’t think it will work to make this without eggs; that’s what holds it together. I made this last night in a cast iron skillet inside the oven. It rose beautifully. (I subbed heavy cream for the milk just cause we like our cream). Thank you for an easy to make, delicious low-carb recipe. It was beautiful to look at and delicious to eat! So glad you liked it, and I love the idea of making it in a cast iron pan! I almost always order chili rellenos when I go to a Mexican restaurant. I really love this layered version in this recipe. I'm trying this soon. Great post, Kalyn! I have been following your recipes on facebook for a few months now. This is the first time I am leaving a comment, although I have tried quite a few of them. I am also in Northern Utah, so I can easily get the ingredients you write about. This bake came out delicious but does not look great because it is so flat…would adding another layer solve the problem? Mine is barely an inch…but tastes great ! You could add another layer and increase the cooking time a little. Or use a little smaller pan. Fun hearing from someone in Utah! Thanks Emily, glad you like it! 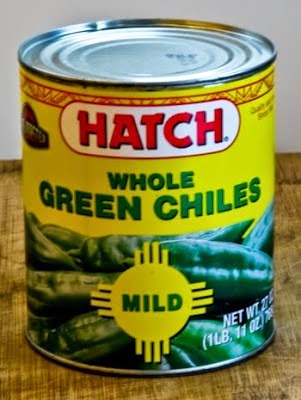 On 11/24/14 I was able to find both the Hatch Whole Green Chiles (1 lb.11 oz) for $4.99 and the Hatch Green Chile Enchilada Sauce (15 oz.) for $2.99 at the Albertson's in at 13401 Washington Blvd., Marina Del Rey, CA 90292 Tel: (310) 574-0606. I have looked all over for them and this is the only place I found recently that carries them. OMG. Kalyn this looks absolutely delicious! I have familly staying with us this weekend and I plan on making this dish.